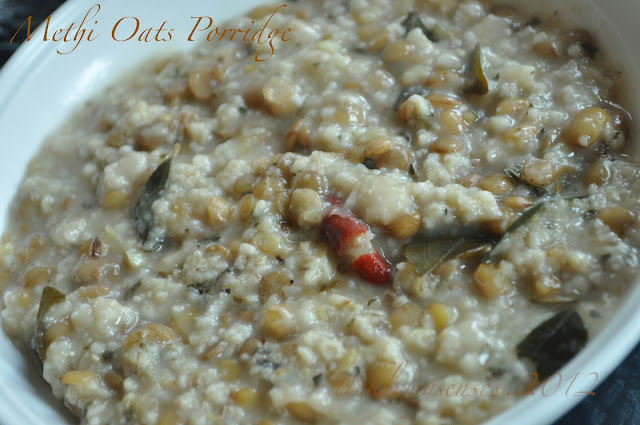 Tickle My Senses: Methi and Oats Porridge. 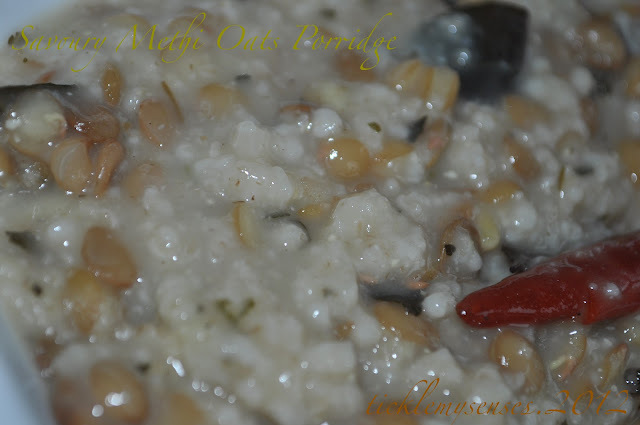 A postnatal recipe for new mothers..
Methi and Oats Porridge. A postnatal recipe for new mothers.. This post has been long time due, almost 18months in the waiting......It takes me back to the time following the birth of Baby A. The early days following the birth of Baby A was definitely a trying period for both hubby and myself. It was tiresome and manic at times, but one that was worth every moment. Being so far away from home with no one to help us in our newfound responsibility, we were enveloped in a bubble of apprehension and joy, at the same time sleepless nights and caring for a newborn child took its toll on our mind and bodies. It was during this period that we both relied on simple, nutritious and wholesome meals that did our bodies a world of good. Of the many postnatal traditional recipes that hubby and me managed to collect from family this one is my favorite. Its is my definition of comfort or soul food. So simple, wholesome, flavourful and nutritious. I could have it any day, every day. Lactation specialists recommend new mothers eating a breakfast of whole oatmeal. It is found to having a soothing or calming effect on many mothers, promoting relaxation and relief from depression, which in turn helps the mother's body produce more milk. Oatmeal also contains minerals that help stimulate the hormone oxytocin, contributing to successful letdown during lactation. It is a good source of fibre which is good for one's heart and gut, as it helps food transit smoothly and avoids constipation and piles which is very common after normal delivery. The Methi/ Fenugreek leaves in this porridge is enriched with minerals like potassium, calcium, and iron, also increases the milk production in breastfeeding mothers (a well known galactalogue). Lentils in the porridge is a good source of protein and fibre. I have used green lentils in this recipe, but any lentil like naked mung beans, butter beans, soya beans or chickpeas can also be used. If using raw mung beans see notes below*. When Im in a hurry I tend to use instant oats as it takes just 3-4 minutes to cook. You could use rolled oats (more nutritious) to make this porridge . Instant Oats: 54 gms or 2 satchets (each satchet weighing 27 gms) . 1. In a vessel heat olive oil/ any oil. Add the chopped ginger, curry leaves and dry chillies and fry for a minute on medium heat, then add hing and the kasturi methi leaves and fry for another minute. To this add the rinsed ready cooked green lentils and fry for 2-3 minutes. Then add the hot water (2 and half cups of water for instant oats and 3 cups for rolled oats), add salt to taste. Cover and cook the lentils on low flame for 2-3 mins. 2. Then add the oats, stir to avoid lumps, then close and allow to cook for 3-5 mins on a low heat till done. Adjust the consistency of the porridge by adding hot water if you like it thinner, adjust salt accordingly, sprinkle pepper powder and squeeze over lemon juice. 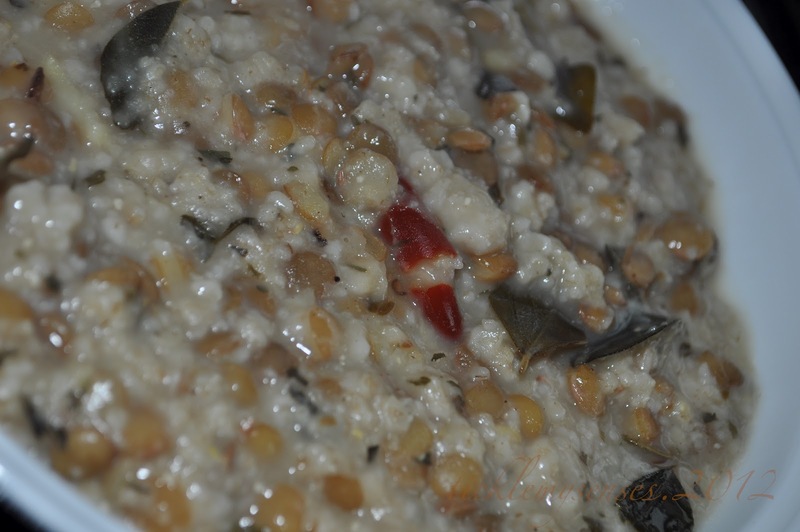 You could add a few drops of ghee over the oats before serving, if desired. Turn off the heat and serve warm for breakfast or as a snack during the day. 1. If using raw mung beans soak a small handful in water overnight then drain and add to pot after frying kasoori methi, add the hot water and salt. Close lid and allow to cook till done ( will take a few mins). You can then add the oats and follow the rest of the recipe as above. 2. Those with gluten sensitivity may want to buy oats that are gluten-free. highly nutritious.. thanks for sharing it..